Doris Ginsburg died peacefully on Aug. 29, 2018, in Portland, Maine. She was born on Oct. 26, 1916, in New York, the daughter of Ida and Emil Markowitz. She grew up in Brighton Beach, New York. Doris met Edward Ginsburg at a Catskills resort and they married on May 5, 1939. Shortly thereafter they moved from the bustle of New York to the small rural town of Montgomery, where Edward managed the Arrolet Corporation, a family business that manufactured electrical outlet boxes. Doris and Edward welcomed a daughter, Roberta, on their second wedding anniversary in 1941 and son, Charles, was born in 1943. After Barbara was born in 1950 the family moved to Williamsport, where the children grew up, and Doris and Eddie lived for many decades. Doris was a wonderful at-home mother. She enjoyed many activities associated with the small but close Jewish community in Williamsport. Her greatest satisfaction came from the many dinners and holiday meals she created for her Ohev Sholom congregation. After her children were grown and the death of her husband in 1971, Doris found a position as the Laboratory Director at Valley Farms Dairy in Montoursville, which became a meaningful career for her. Doris enjoyed traveling to California to visit her daughter Roberta and son-in-law David. She enjoyed her visits to Maine to see granddaughters, Emily and Abigail and grandson, David. She was delighted to be able to travel to Israel in her seventies. Doris was the grand matriarch of the family and always on hand to prepare holiday meals and make sure that cooking and clean up was done to her satisfaction! As the recognized family historian, she kept in close touch with her and her husband’s families throughout the years. In 2006 she moved to Portland, Maine to be closer to Barbara and Peter and her extended family. She lived at Park Danforth, first independently and then in Assisted Living. She very much enjoyed her community there. She and her family are very grateful for the thoughtful and attentive care she received from the entire staff. She loved the visits of her granddaughters and great-grandchildren, Duncan, Penelope and Alice. Watching them grow and being a part of their lives brought her great pleasure. 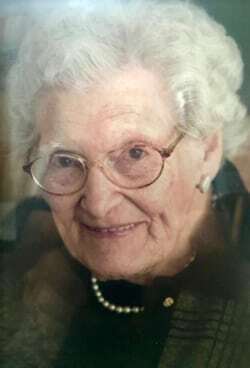 Doris was predeceased by her husband, Edward; her brother, Alfred; her daughter, Roberta; and her grandson, David. She is survived by her son, Charles Ginsburg, of Baltimore, Maryland; her daughter Barbara Shaw and son-in-law, Peter Shaw, of Falmouth, Maine; granddaughters, Emily Shaw (Leigh Rose), of Bethesda, Maryland and Abigail MacDonald (Chris MacDonald), of Cambridge, Massachusetts; and great-grandchildren, Penelope and Alice MacDonald and Duncan Shaw-Rose. Funeral service will be held 11 a.m. Sunday, Sept. 2, 2018, at the Maneval Allen Redmond Cremation & Funeral Home, 500 W. Fourth St., Williamsport. Burial will follow in Ohev Sholom Cemetery, Montoursville. In keeping with Jewish tradition, there will be no viewing or flowers. A celebration of her life will be scheduled in Portland at a date to be determined.